The operational risk of a company is often connected with mistakes of the personnel and internal processes. A company is capable of controlling these risks and must control them. Fortunately for business, it is possible to efficiently protect or insure itself against unfavorable influences of global external factors. Risk hedging was created for this. Definition. Risk hedging (hedge is a fence) is a protective mechanism of limitation of losses from possible negative scenarios in the financial markets. Hedging does not set a goal of making a speculative gain. Hedge is a set of exchange financial instruments, which is formed for a case of a negative scenario development. Such a portfolio could be compared with a life ring, which is used rarely but saves life. The cost of this insurance is insignificant compared to possible losses. Financial crises develop a long time, start unexpectedly and get around instantly. Their consequences are just like consequences of a bomb explosion – someone survived and someone didn’t. More often, the companies, which had bought a hedge, continue their activity on the financial field scorched of competitors. The first efforts to insure against negative scenarios were undertaken by traders as early as in the Middle Ages, however, they were of a chaotic nature. Real systematic application of financial insurances became possible with emergence of exchanges. The first forward contracts, which were executed between producers and buyers of agricultural products, appeared in 1965. The producers, through selling futures, fixed the prices on products at the moment of making a deal. Under such contracts, the producer was bound to deliver products in one month, quarter of half a year. In such a way, the producer eliminated the risk of a possible product price decrease due to, for example, a high yield. The first examples of hedging in the securities market were recorded in 1982. Stock holders opened opposite positions in indices and, that way, hedged negative fluctuations of the stock cost, receiving guaranteed dividends. That was also when they started to hedge currency risks. Options were introduced in 1984. The option buyer paid a fixed insurance cost and received a protection from negative market fluctuations in return. In contrast to the futures contracts, where the value is determined by the exchange quotation, the option buyer chose the value independently. 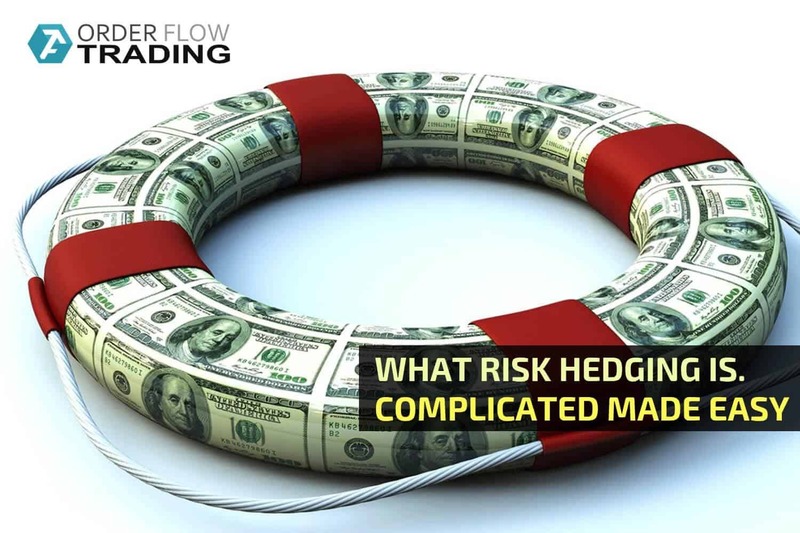 Due to this feature, the options hedging started to gain popularity. 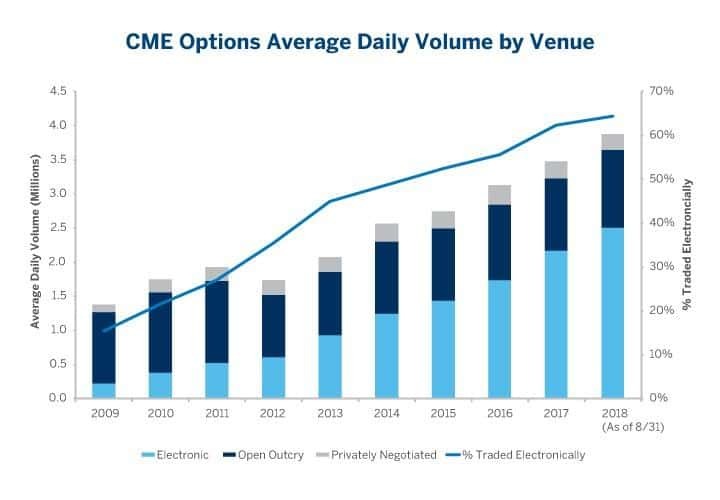 According to the Chicago Mercantile Exchange (CME), a daily options volume increases every year by 5% and an average daily volume exceeded USD 3.5 million in 2018.
traders who are interested in shaking markets, booming bubbles and provoking wide price fluctuations. These are, first of all, major traders who buy at minimum prices when sellers are in panic and sell at maximum prices when buyers are in euphoria. traders who are interested in stability, predictability and calmness. These are real sector producers and national regulators. The exchange hedging mechanisms allow developing a system, in which interests of traders and real business are in balance. It is more profitable for a bank today to sell insurance and maintain a stable environment in the market, than to make aggressive deals in order to make money on the exchange rates. increase the credit rating and business reputation. Example. 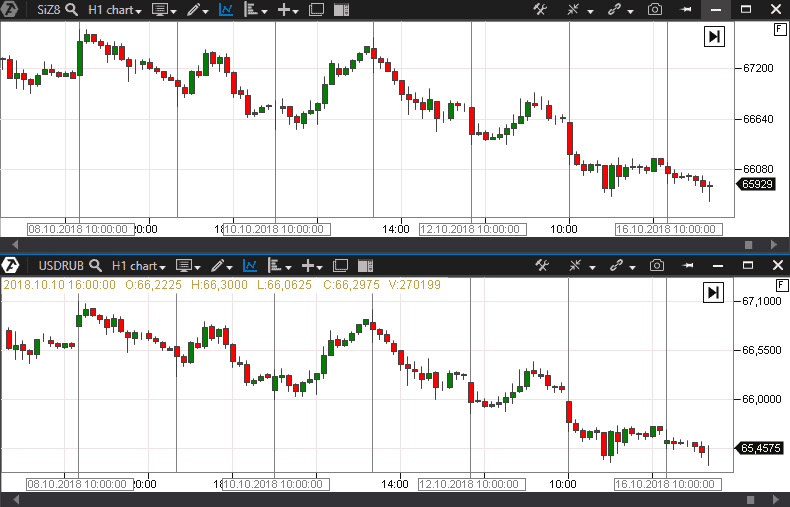 The picture below shows overlay of two weekly graphics, where the red one shows the cost of the Brent oil barrel and the blue one shows the cost of the American Airlines stock. The company stock stayed at the level of USD 50, when the barrel cost USD 70, but increase of the oil cost higher than USD 70 resulted in a negative scenario. Stock of the American Airlines company lost about 40% of its value in 2018. Let us assume that an investor kept the stock of American Airlines in his portfolio anticipating its growth. In order to insure the portfolio, he could have opened a long position in the forward oil market, having bought contracts with a half a year expiration. Such a hedge would have brought loss on the stock but profit on the oil futures. options hedging. In this case, a complex portfolio with options is built up. WHAT INSTRUMENTS ALLOW BUILDING HEDGE PORTFOLIOS? A futures, or a futures contract, is a derivative financial instrument, which repeats the movement of the main instrument price (you can find more information about futures in this article). For example, a futures contract Si repeats the movement of the USD/RUB currency pair and could be used as a hedging instrument. Options are a financial instrument, which provides its holder the right to buy or sell the underlying asset in future at a set price. time until expiration of the options. Unlike a futures contract, a possible loss of the option holder is fixed and is equal to the cost of buying. In other words, the option buyer knows the risk size beforehand and assumes it with open eyes. In the event of a negative scenario, the option will bring profit to its holder. The option price is a calculated value and it could be represented in the form of a candle chart. Below you can see a chart of the Put option 65000 price to the underlying asset Si. Options are complex financial instruments and special option calculators are used to calculate their value. Option hedging would be justified in situations when the market “is storming” and bursts of high volatility are expected in future. Let us consider an options hedging example. 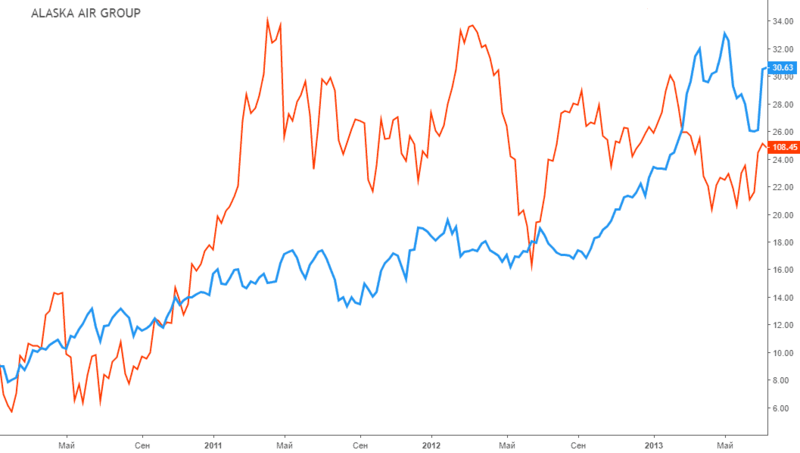 Below you can see a chart of the price of the option contract on the RTS index. On April 9, 2018, stocks of many companies in the Russian market lost about 10-15% of their value and the rate of the national currency went down by 10%. 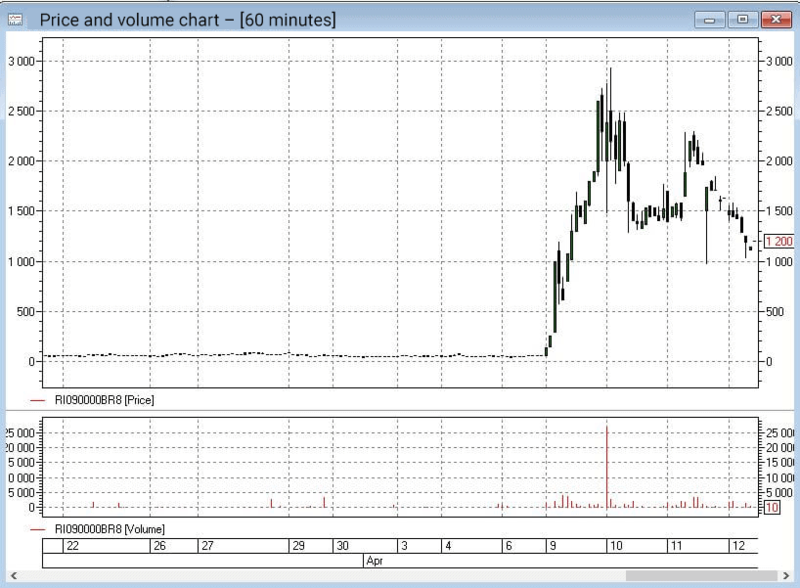 The Put option 90000 on the RTS index went sky-high from RUB 90 to RUB 2,500 in two days. Holders of this option made a profit of approximately 2700%. Thus, profit in the options market compensated the loss from the fall of the stock value in the stock market. This is the idea of options hedging. This example clearly shows significant profitability on options, however, options hedging more often is not justified when the market is calm. Since in such a situation an investor, most probably, would lose the premium paid for the option. In order to understand better how to use exchange instruments for hedging, let us consider the following situation. Let us assume that some company is specialized in air transportation. The main expenditure item of the budget is purchase of aviation kerosene. Such a budget will be sensitive to the cost of fuel. The management knows about volumes of upcoming purchases at the stage of planning. If the oil price goes up, the fuel, consequently, will become more expensive and would hurt the budget. What to do? To hedge by futures. In order to compensate a negative scenario, the company buys oil futures contracts with account of volumes of upcoming purchases. The oil price increase will not be critical for the company, since it will gain profit from selling futures contracts. The company will use the profit received in the forward market to cover additional expenditures on the fuel purchase. And in the event of decrease of the oil quotes, the futures will bring a loss, but cheaper oil results in cheaper fuel and this would save funds. Below is a chart where a blue line is the dynamics of the value of the stock of the Alaska Air Group air transportation company and the red line is the dynamics of the Brent oil price. Despite the strong increase of oil prices up to USD 110, the company stock showed growth of about 135% for the period from 2011 until 2013. Some air transportation companies went bankrupt at such oil prices. We can only guess that the Alaska Air Group management thoroughly approached the risk hedging issue and, in doing so, save the company from bankruptcy. A similar situation is possible in a company, which deals with retail sales of foreign cars. Let us assume that some conditional car dealer Auto-Moto Lux buys Mercedes cars and pays in EUR. When selling cars, the dealer gets profit in RUB. There is a risk that the RUB/EUR exchange rate can become 2-5% weaker in several days. In this case the dealer will buy cars at 2-5% more expensive. The dealer would have to increase Mercedes prices, which would have a negative impact on the demand. How to solve the problem? The Auto-Moto Lux management decides to build a hedge portfolio consisting of long positions in the forward market on the EUR/RUB currency pair. In the event the national currency becomes weaker, such a portfolio will bring profit to the dealer, which would cover negative consequences of the sales volume reduction. On the one hand, financial markets bring risks to the stable activity of companies. On the other hand, the same financial markets provide various ways to insure against such risks. Hedging is an application of these ways. Hedging of financial risks is applied successfully all over the civilized world and it proved its efficiency. At the same time, some companies choose to “remain blind” to a probability of negative fluctuations in the financial markets, which could result in contingent losses. 5 RULES OF SUCCESSFUL TRADING. HOW TO MAKE MONEY ON THE ONLINE EXCHANGE EVERY... What options are. 5 examples of options hedging.